← Wales. A coal mine. Easter Monday. What could be better? 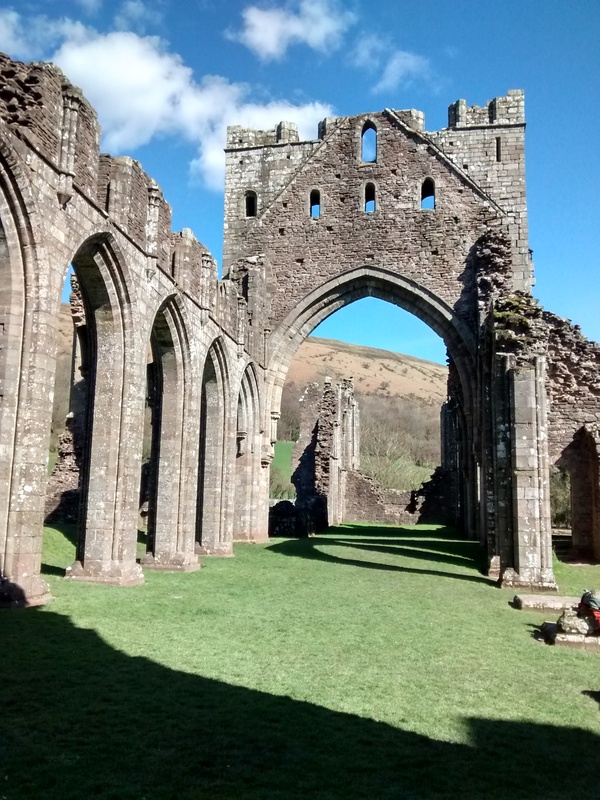 Llanthony Priory near the Brecon Beacons still offers a moment of peace. After our trip to the Big Pit at Blaenafon that you can read about here http://tinyurl.com/k226fo9 we drove to Llanthony Priory where, we had been told, there is a spectacular view at the top of the hill. It’s about 12 miles from the Pit so just a few minutes drive through beautiful countryside. There are plenty of parking spaces, although whether that is the same during the height of the summer, I wouldn’t like to say! 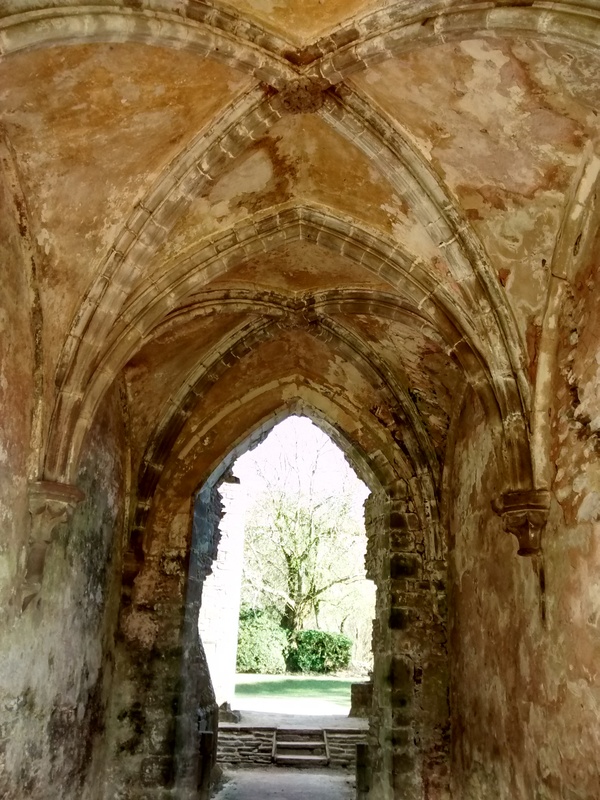 From the moment I entered the grounds of this ruined priory, I felt completely at ease; there is something very calming and almost spiritually soothing within the destroyed walls of this once great house of God. Maybe it was the warmth of the sun or the mighty hills that rolled down towards the site, but something touched my soul as I walked alongside the demolished remains and judging by the contentment of the other visitors, it wasn’t just me who felt at ease. There is enough of the original building left for you to appreciate how enormous it must have been and the display boards explain the layout of the rooms so you can work out what was where. There are remains of staircases where you can imagine priests hurrying along to vespers and a narrow pillar of stonework towers above you as if the very spirit of prayer continues to want to reach up to the heavens. 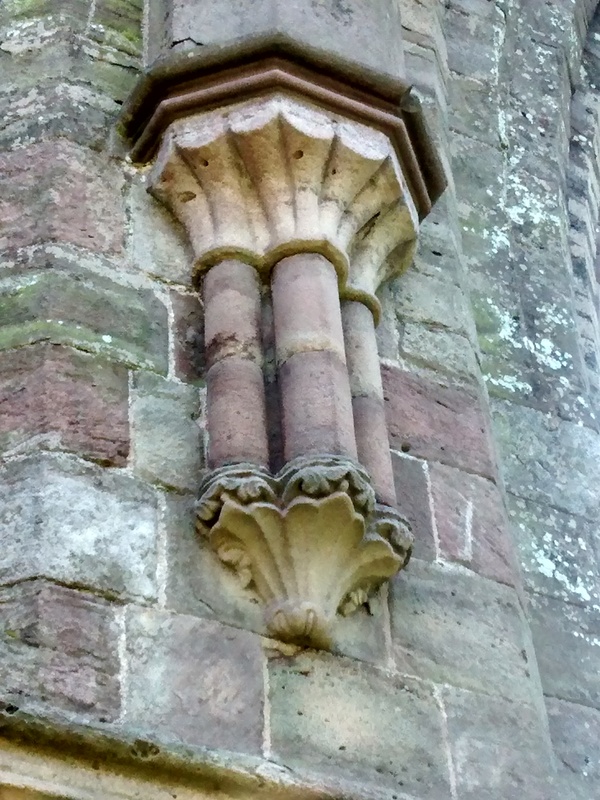 There are still remnants of the ornately decorated and carved stonework that formed part of the elaborate internal design; once protected from the external elements, now stand as firmly as they can whilst being battered by the Welsh weather. You can but imagine how beautiful it was when the priory was in its heyday and of course prior to Henry VIII’s dissolution. It is very much a ruin, but one that retains the spirit of its original function, and most of the visitors were sitting, relaxing and enjoying their surroundings. It does ask you to keep your children from clambering on the walls and other surfaces to try and limit the decay and on the whole, everyone respected this. The hills that surround the priory are like huge undulating waves holding anything at bay that might wish to cause further damage, protecting the priory as a gigantic well endowed mother might her children. I would have liked to stay there much longer than we did and absorb the peaceful vibes that resonated among the ruined walls, but we had to return to the car with the more familiar sounds of “I’m thirsty” and one son pestering the other, but the few moments of relative peace and tranquillity I had enjoyed were a pleasant memory. Whilst I didn’t get to the top of the hill to see the view, my senses were just as satisfied by the serenity I experienced among the fallen walls of the priory. 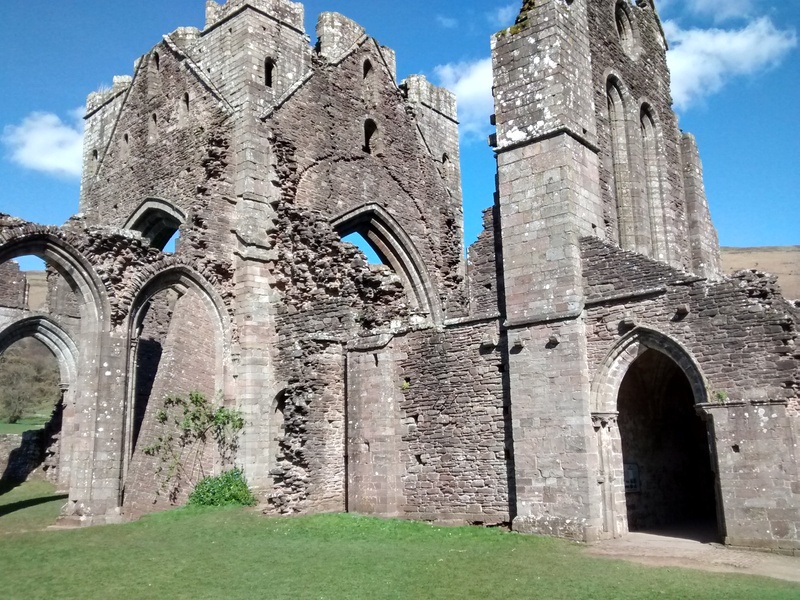 This entry was posted in Family Days Out and tagged Brecon Beacon, church, dissolution, Henry VIII, Llanthony Priory, monastery, ruin, Wales. Bookmark the permalink. 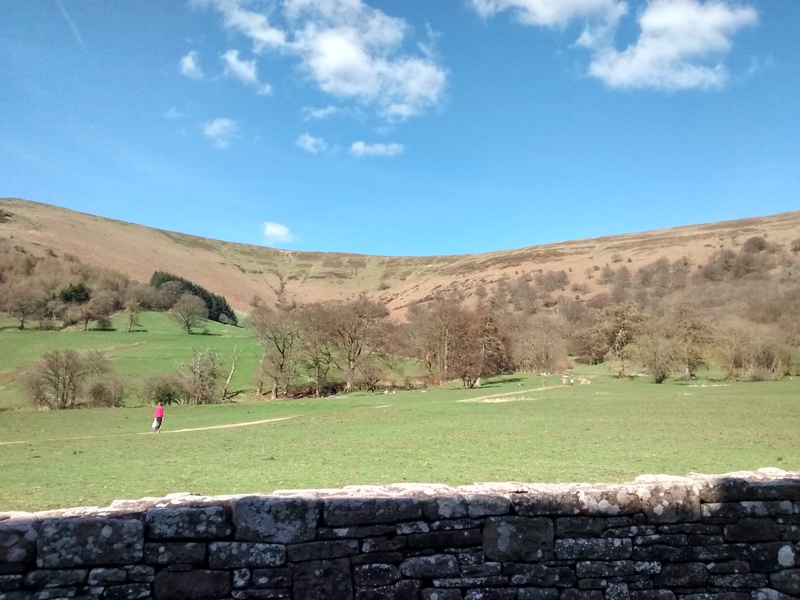 8 Responses to Llanthony Priory near the Brecon Beacons still offers a moment of peace. It is a very special place isn’t it, and I do wish I could have walked up the hill. I will definitely do that if I go again, which I hope to one day, perhaps without sons! My boyfriend is super fit and marched up….I kind of zig zagged up it and took my time – much better! We think the priory is haunted so I much prefer the walk! I think I’d probably be a combi of the march & zigzag with occasional stops on the way! Haunted you say? That’s slightly concerning..! He’s probably just trying to scare me to make me walk faster!! This sounds like a wonderful place to visit, Sophia. I have been to Waverley Abbey in Farnham which has very similar fan vaulting, but Llanthony sounds incredible with its remains of staircases! Must put it on my visit list. Thanks! It definitely had a special feel for me Kate that came over me the moment I walked inside its boundary. 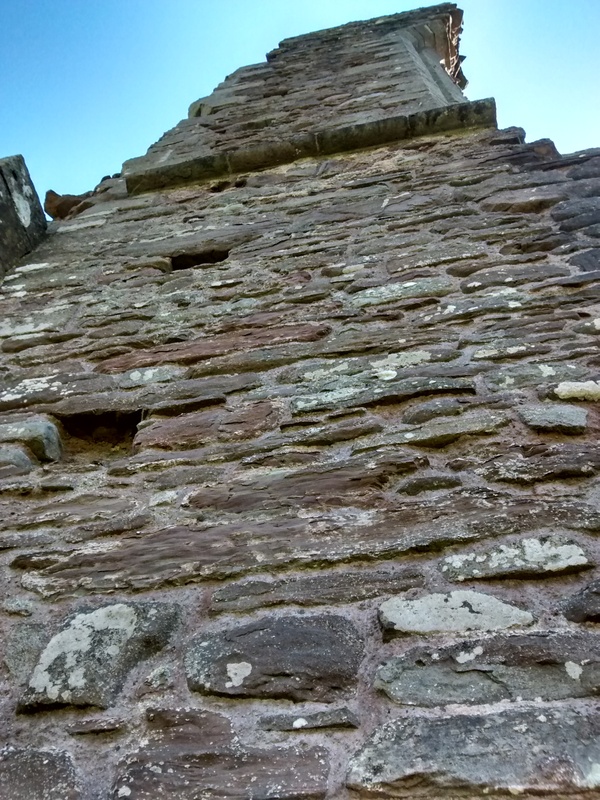 But I wouldn’t wish to mislead you – the remains of the stairs are very much ‘small’ remains; two or three steps only! But it still created the image for me.